Assistant Professor of Music Kimberly Archer stands outside Dunham Hall. SIUE Assistant Professor of Music Kimberly K. Archer racked up a few miles with her latest musical achievement. Her creative journey for "Symphony No. 3" began in Montana and finished in Wisconsin a year and a half later. In June 2006, Dr. Archer received faculty development funds from SIUE's College of Arts and Sciences and the Department of Music to study in Montana with composer David Maslanka. Maslanka has written nearly 100 pieces of music and has received the National Endowment for the Arts Composer Award on three occasions. He is best known for his compositions for wind and percussion. Maslanka's hospitality to Archer was generous and proved to be quite productive. In addition to opening up his home to her during her stay, he introduced her to Dr. Christopher Werner. Werner is a band and music teacher at La Crosse Central High School in Wisconsin. The two of them "hit it off right away," according to Archer, and a fruitful collaboration was born. Archer and Werner decided that she would compose a piece of music, and Werner's students would perform it under his direction. After more discussion and mulling the idea around for a while, Archer began writing the piece in June of the following year. The result six months later was "Symphony No. 3." 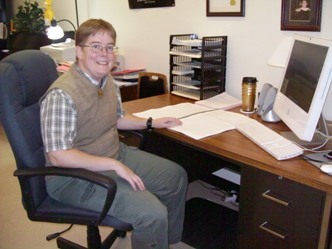 Assistant Professor Kimberly Archer in her office at SIUE. "My inspiration for the work was my relationship with David (Maslanka,)" Archer said. "When I started, I had no idea what the thing was going to be. Composing is an organic process that just takes on a life of its own. I was as surprised at the end as everyone else," she added, explaining that a great deal of material ended up "on the floor of my office." From the beginning of the writing process to the end, the finished product--a 29-minute piece-took six months for Archer to complete. Once written, there was just a bit of fine tuning to do. The score was delivered to Werner in January of 2008, and his students began rehearsing it right away. Archer herself went up to spend time with Werner and his students in February, listening to them perform. There was a minimal amount of tweaking and revising that was done before the world premiere of the symphony by the La Crosse Central High School Wind Ensemble in April. "I simply cannot emphasize what a remarkable event that was," Archer stressed, adding that the achievement speaks to the quality of the musicians and their director. The piece was musically complex, and Archer said that many high school-level students often do not have the stamina or the training to perform one piece continually for half an hour. "Symphony No. 3" was also performed by the Illinois State University Wind Symphony, will be played at the University of Nebraska in March of 2009, and possibly also in Florida. Two previous Archer compositions - "Symphony No. 1" and "Symphony No. 2" -- have been performed at SIUE. She and Werner have also laid the groundwork for a "Symphony No. 4" to happen. After completing "Symphony No. 3," Archer decided to apply for an ASCAPLUS Award from the American Society of Composers, Authors and Publishers. Normally, she shies away from competitions, but decided it might be worth attempting. The award recognizes scholarship and prolific composers. A group of independent and distinguished panelists judges applicants for the ASCAPLUS Award. According to ASCAP, these awards are based on the "activity generated by each writer's catalog (particularly in regard to recent performances.)" Although Archer is proud of this recent accolade, she notes other benefits. "It's nice to be appreciated and challenged by my colleagues in the Music Department," she said. "The real reward is in the recognition and attention from them and others at SIUE and the surrounding community." As a music theory and composition instructor, Archer believes this award has direct benefits to her classroom, particularly for the 11 students majoring in the composition program. "It demystifies things," she said. "I'm out in the world doing the kinds of things that they want to do. The goal is that I'm modeling the professional behaviors that they hope to achieve." Archer also brings her students along to local and regional performances of her compositions, so they can see the end result of the process. Students find this to be "quite exciting and motivating," she said. 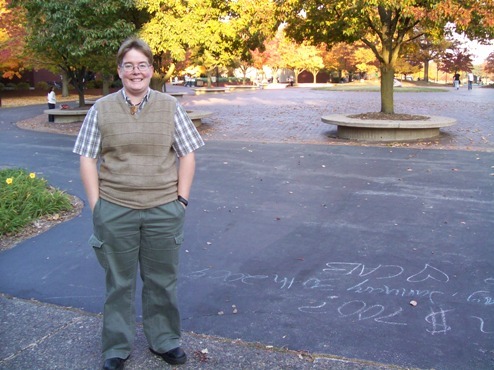 Archer has been at SIUE since 2005. Her other noted compositions include Westward Sentinel, Emergence, and For I Believe, which were all completed in 2006; Ballad for Aisha from 2005 and Awakenings from 2002. She has served guest composer residencies at several venues, including the International Women's Brass Conference National Convention, Florida State University, Central Michigan University and Illinois State University. She also works as an arranger for college and high school marching bands across the country and has been a music copyist for the Chicago Symphony and Dallas Wind Symphony.